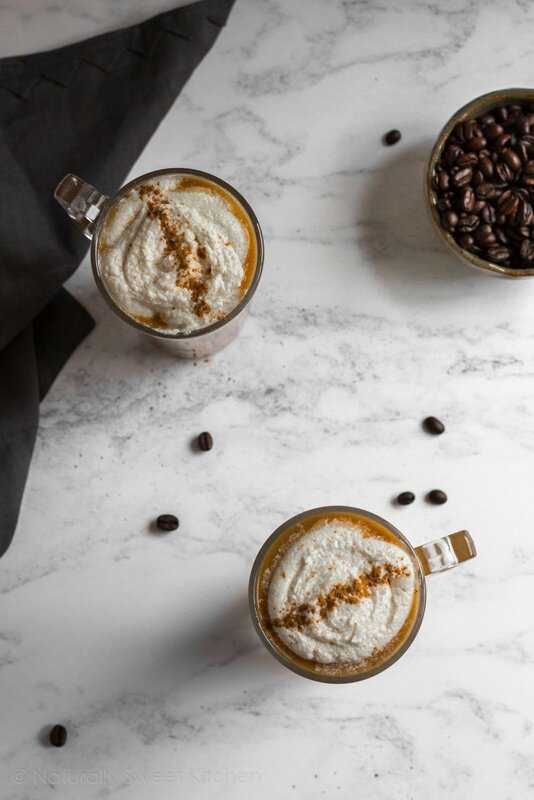 This homemade pumpkin spice latte recipe will make you wonder why you ever went to Starbucks. Completely vegan, 100% all-natural pumpkin flavour, insanely delicious. First, these puppies are made from 100% natural ingredients. I heard tell that Starbs switched tactics recently and now uses “real” pumpkin in their PSLs, but it’s still only a small percentage of their famous pumpkin spice sauce. And in case you were wondering, the other ingredients in that sauce are sugar, condensed skim milk, 2% fruit and vegetable juice for colour, natural flavours, annatto, salt, and potassium sorbate (source). Delicious? I’ll take the natural pumpkin flavour, please – hold the sorbate. Third, you don’t need a fancy espresso maker to enjoy this PSL. I don’t own one and likely never will. 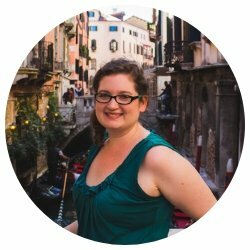 It’s not an object I can see myself needing, and I only have room enough in my tiny flat for the necessities. 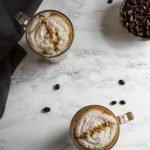 For these lattes, I used instant espresso powder – the same one I use to flavour my Espresso Protein Truffles and No-Bake Espresso Cheesecake. It’s important to use espresso powder, not instant coffee granules. Espresso powder is finer, has a richer flavour, and dissolves into the latte easier than the granules. This is the one that I use. And last but by no means least, Homemade Pumpkin Spice Lattes are incredibly delicious. As if this needs to be said, but homemade is so much better than store-bought. 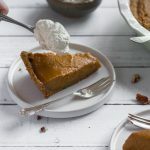 The natural flavour of the pumpkin purée mixed with the usual blend of comforting autumnal spices and maple syrup creates a cosy cup you’ll want to sip underneath a blanket in your fuzzy socks. It’s slightly thicker in consistency than the PSL you’re used to, reminiscent of a thick homemade hot chocolate, but it glides down smoothly, warming you up from the inside out. 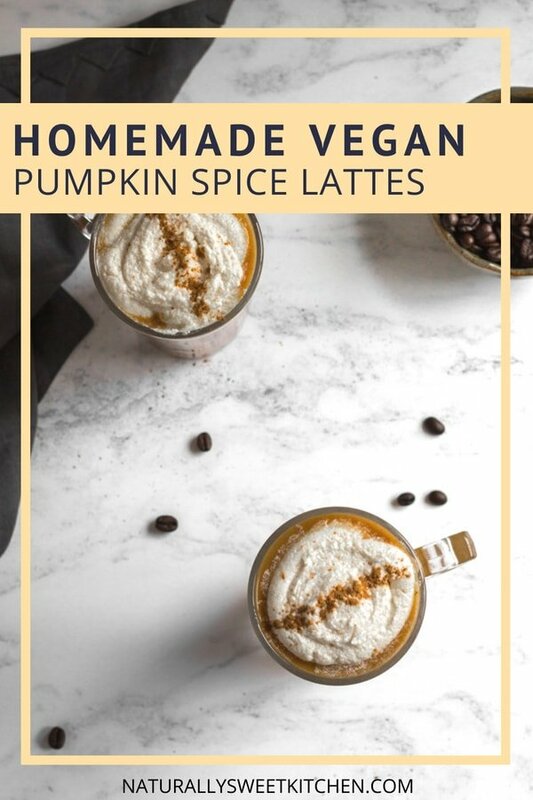 I hope you love this vegan Homemade Pumpkin Spice Latte recipe, friends! It’s creamy, cosy, and a wonderful way to treat yourself during these colder autumn months. 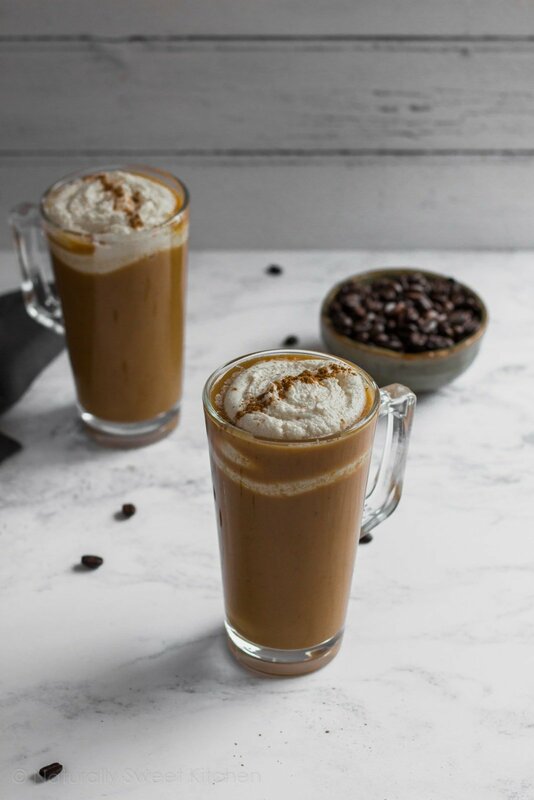 This homemade pumpkin spice latte recipe will make you wonder why you ever went to Starbucks! Completely vegan, 100% all-natural pumpkin flavour, insanely delicious. To a small saucepan, add the pumpkin puree, maple syrup, spices, and salt. Increase the heat to medium-low and whisk together the ingredients until well combined. Once the pumpkin mixture begins to warm, slowly whisk in the non-dairy milk until fully incorporated. Stirring frequently, allow the latte mixture to reach the scalding point – when it just begins to bubble around the edges of the pot – then turn off the heat. In each serving mug, add one shot of espresso or dissolve 1 teaspoon of espresso powder into 3 tablespoons of the hot latte mixture. Top off the mugs once the powder is completely dissolved. If desired, top off the lattes with coconut whip and a dash of cinnamon. Serve immediately. 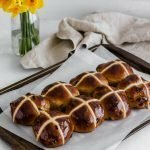 I used oat milk as my dairy-free milk when testing this recipe. You can adjust the sweetness based on your preference. Begin with the base amount of 60ml and then add a touch more maple syrup as desired to individual lattes. If you don’t drink caffeine, feel free to leave out the espresso powder or shot. It tastes just as delicious caffeine-free. The pumpkin spice latte base will keep in the fridge for up to 3 days. This was a must try so I jumped right in and gave it a go! These are truly the best thing going. 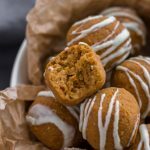 A must make for any pumpkin spice fan!!! Thanks!